Things have been a little hectic here this month due to some rather major building works to our home. I must admit it has slowed me down a bit and will so for a few more weeks. However with all your contributions coming in i.e. cat stories and poems, cat pictures and names etc. the site will always have something new to see. The news letter this month has a sort of cat rescue theme as I have received some excellent true life stories this month and wanted to make sure that you did not miss them. Don't forget to enter the cat competition again this month. I really enjoy reading all your humorous captions and the prizes aren't bad either. Don't forget to get in touch if there is any thing you would like me to include on the website that I have missed and I will do my best to remedy the situation.. If like me you support re-homing cats from animal shelters rather than buying them from breeders, you will very much enjoy the cat rescue stories which have been sent to us this month. The second is all about a cat called Big Ozzy who was rescued one day before being put to sleep for being to fat for rehoming. 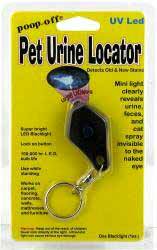 The pet urine finder keyring proved very popular last month so I have included it again just in case you missed it last time. Both stories will have you smiling and crying but are really well worth the read. 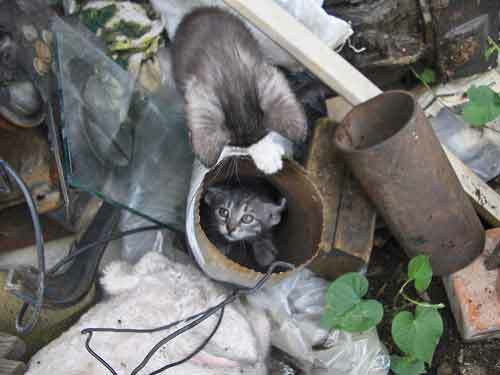 They were both sent in by one of our visitors to the site who has found that cat rescue is in her blood. She also writes a good story and has really added excellent content for the site. I hope you enjoy reading the stories as much as I did. Don't forget to subscribe to the RSS feed for our Whats New cat Blog. Every time a new submission is made a new entry is added to the blog and the only sure way of keeping up to day is to be automatically notified when this happens. Plus you get to see the new daily Garfield cartoon as well, a sure way to brighten anyones day. So click on the RSS button on the blog page Here. Here is March's Caption Competition. All you have to do is write a caption for this picture. You are the first to see it as it doesn't get posted onto the site for a few days, so it gives you extra time to get your entries in first. The deadline for this competition is March 24th. The best caption will be chosen and the winners name and caption will be posted on the www.our-happy-cat.com competition page. 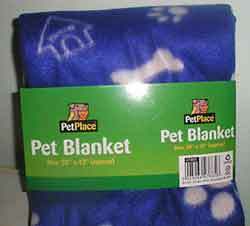 This month the prize will be a soft blue pet blanket (size 38" x 33"). Great for your cats basket or pet carrier. Yikes it's snowing in London. This almost never happens and I'd like to keep it that way. It's just too cold for me and I don't like getting my paws cold and wet. 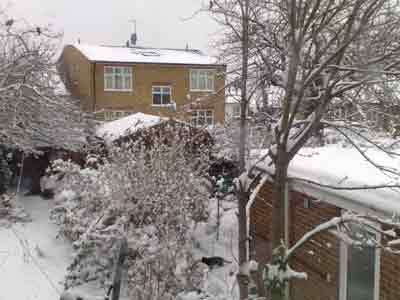 There are some silly cats though out there, you can see Pixie down in the snow. She really is a little adventurer but then she is much younger than me. I don't know what she thinks she is doing as all the birds are just sitting in the trees, she won't get any chasing fun today. Thank heavens I have all the things I need indoors, I think I will just sleep through it all. Playing is fun, right? So why do we need to know anything else about it, surely that's is all there is to it. Well it's true that the main reason we might play with our cat is because it is something fun to do, but for your cat it has a far more important role and is key to their general mental and physical well being. This means that it should be something that all cat owners should spend a little more time thinking about and incorporating into their every day cat care routine, rather than as an occasional playtime. Hunting is a instinct that is in bred into every cat, even for our domesticated feline friends, who do not need to hunt for their food, will still have a strong desire to hunt for prey. But hunting plays another important role for cats other than for finding food; it also helps to build their confidence, their agility and keeps them fit. It also would occupy a cat for most of the day out in the wild and so a cat that no longer has the opportunity to hunt every day will find itself with a lot of unfilled hours. Many cat owners will have experienced a bored or depressed cat that shows their frustration through aggressive behaviour, such as chewing or scratching the furniture or one who hides them selves a way and becomes a very shy and timid cat. A good substitute to hunting is therefore energetic chasing, stalking and pouncing playtimes, where the cat can engage all their natural instincts into the game and feel stimulated by the play. Unfortunately just leaving a motionless cat toy lying around just doesn't meet those requirements, so it is important for cat owners to interact with their cats during playtimes. Ideally you should play with your cat at least a couple of times a day for about 10 to 15 minutes each time. Of course this may not always be possible but at least one playtime a day is required to keep your cat healthy and happy. Playing with your cat an hour before bedtime is a good habit to get into, especially if you have a very alert nighttime cat that frequently tries to wake you up at night. This will help to use some of that energy and encourage them to sleep afterwards. The length of playtime will very much be dictated by the cat, some may be quite happy to play for 15 minutes while others prefer shorter more frequent games. The secret to playing with your cat is to think like your cat, do they like to stalk and pounce onto small ground creatures like mice or do they prefer to climb trees to hunt flying creatures. Your cats preference will help you to decide which sort of toys would suit them better, such as furry mice and balls for the ground hunter and feathery, colourful toys which can be dangled and simulate flight for your bird hunter. It is also important that we make the game as realistic for your pet, simply rolling a ball along the floor will soon become boring and uninteresting. Instead make sure that the playroom is interesting, placing open paper bags around is a good way to provide plenty of hiding places to pounce from. Also vary how you manipulate the toys, for instance make some movements fast, others slow, hide the toy behind or under something. This will make the game far more realistic and exciting for your cat, who can utilise all their hunting skills like stealth, speed, agility and cunning. Keep the toys you use with the cat hidden away after use so that they do not become to over familiar with them and lose interest. Providing new toys from time to time will help to stimulate your cat's interest in the games and encourage more energetic play. It is also advisable not to use treats too often during playtime as this may cause weight gain over time. Treats may be helpful at first to encourage a shy or timed cat to come out and play but as their confidence grows, treats should be removed from the games. Playing with your cat as you can see is much more than just a fun thing to do, it will promote confidence, fitness, reduce boredom and aggression and generally help in your cats over all mental and physical health. As an added bonus, regular play between you and your cat will strengthen the bond you have with each other. Your cat will associate you with fun and excitement and will seek your company out more often than with someone who just feeds them. Over all playtime will benefit everyone involved and should be encouraged throughout a cat lifetime.